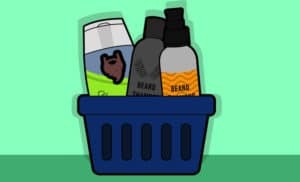 Choosing the best tools and supplements for you and your beard is a tough task, but one that is very much worth the effort. 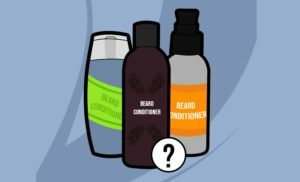 Oils, balms, shampoos – there is a huge range of products out there designed to help manage and nourish your beard, and we have articles on all of them, such as this one. 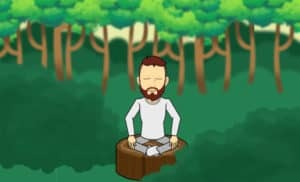 Beard Brush vs. Beard Comb. So in this article that is exactly what we’re going to do. 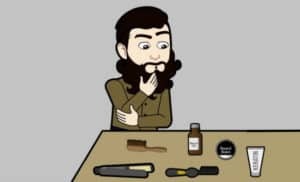 We’ll look at what kind of beard each tool is best for and the pros and cons of each tool, so you can decide which one is best for you and your beard. The beard brush is optimal for maintaining shorter beards whereas a beard comb is better at taming longer beards. A beard brush is perfectly designed to keep your beard clean by removing dirt and debris as well as dispersing oils and balms throughout your beard. Compare that to the beard comb which is the perfect tool to detangle and style longer beards. 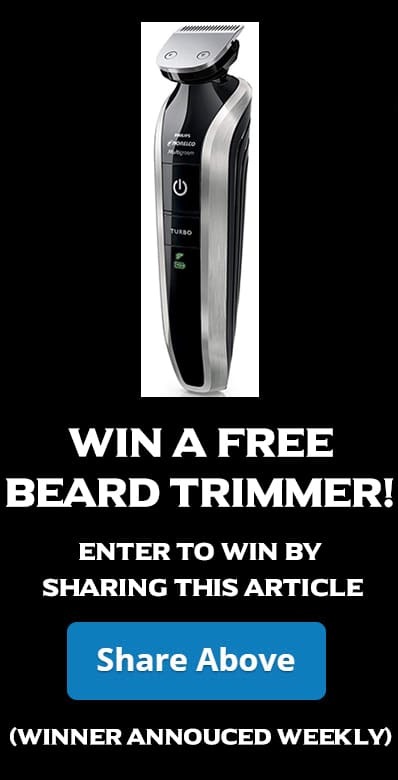 It can also help you trim it safely and effectively. Both are useful tools in grooming and maintaining a beard. A beard brush is, unsurprisingly, a brush-shaped tool, one of the most ubiquitous personal grooming tools in the world. It has a handle at one end and bristles at the other. These bristles will usually be made of a natural material, boar bristles being one of the most popular. A beard comb, on the other hand, will usually be shorter when compared to a brush, though sometimes they too can be designed with a handle. While the brush employs bristles, a beard comb has teeth. It will usually also be made of harder materials such as plastic, wood, bone and even metal. Comb vs. Brush – Which is Better? 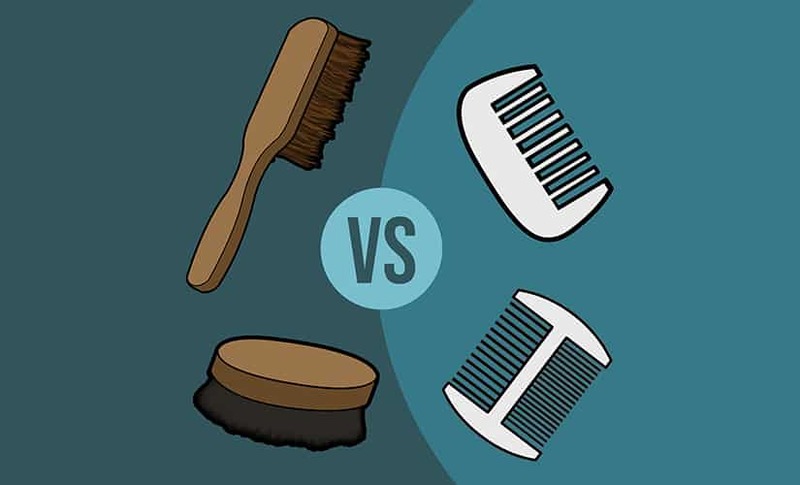 That is pretty much the basic differences when your looking at a beard brush versus a beard comb. One has bristles, one has teeth, and they are made of different materials. Ultimately they have the same purpose, which is to help you to groom and maintain your beard. Because of those differences in design and material though, they both work in slightly different ways. They also have different advantages that make each one better for different styles and lengths of beard. So lets get this party started by taking a good look at just what a beard brush is going to bring to the table. One of the biggest advantages of a beard brush is that it’s a great tool for cleaning beards. It is after all a truth universally acknowledged that a man in possession of a good beard must be in need of ways to keep it clean. Just the fact that a beard is a food and dirt magnet. 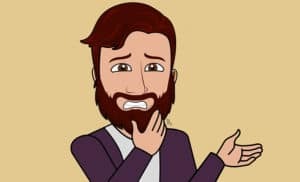 It’s nothing to be ashamed of, every bearded man has at some point looked in a mirror and spotted a dab of melted cheese or a spot of pasta sauce that has set up a nest in your beard. There is also the natural oils and sebum that your skin produces all day too. 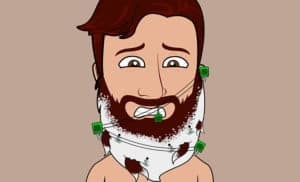 You’ve got to keep them under control too, especially as they can be a big cause of beard dandruff [link to Prim and Prep dandruff article]. A beard brush, especially one of natural hair (like boar) will reach all the way down the beard hairs. That means it can clean the beard from skin to tip and lift and remove dirt and debris. That ability to reach all parts of the beard also means the brush is great for maintenance purposes. So whether you prefer beard balm or oil, a good beard brush can help you to get the maximum benefit from the product that you use. This is because of the physical make up both of the material used in the brush bristles but also in the design of the bristles itself. These two elements of the brush essentially work in tandem to gather up the product – whether oil or balm – and work it through the beard from your skin to the hair tips. A brush is also better at training your beard when compared directly to a comb. Again this is due to the composition of a brush, where the bristles are way more densely packed than the teeth of a comb. There is more friction there to grab errant beard hairs and draw them back into line. Well for us, there are two good reasons to do this. Firstly it will help your beard to grow better. 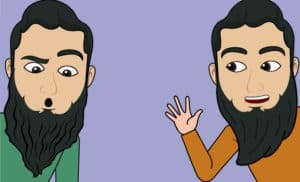 By moving the hairs into one common direction, it makes it easier to work oils and balms through the beard, which is very important for a healthy beard. It also means your beard looks much better. First thing in the morning, your beard can look like you’ve just done a photo shoot for American Grizzly, with wild growth and hairs sticking out at all angles. A beard brush is an easy way to calm your beard and get all the hair tucked in line, making your beard look sharper, more groomed and even thicker. So that is what a beard brush can do for your beard. But we’re not here to just blow smoke up the brushes…er… handle. 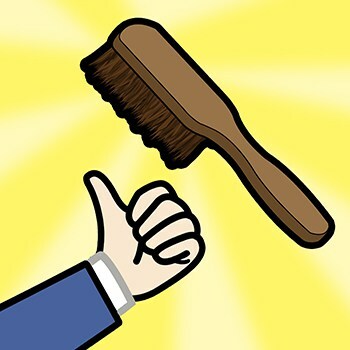 We also need to take a look at the brushes greatest rival, the comb. The Pepsi to it’s Coke, the Green Bay Packers to its New England Patriots, the Optimus Prime to its Megatron, if you will. The best beard combs on the market are going to bring three distinct advantages to the table. A beard comb is very useful for styling a beard. That doesn’t apply so much to shorter beards, since the comb teeth need a reasonable amount of beard hair to grip and work with. But on longer beards, you will find that a comb is very useful when styling your beard. Simply apply your oil or balm by hand, then use the comb to style your beard. 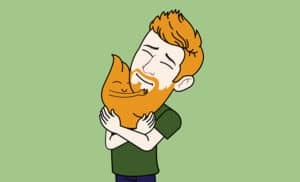 This could be shaping the beard, such as drawing it to a point. It can also be useful for straightening the beard. Another big advantage with the comb is its ability to detangle longer beards. We already mentioned above how a beard brush can be useful in bringing a shorter and unruly beard under control. Whilst that is certainly true with shorter beards, a brush will struggle with longer hair. That is where your good friend the beard comb comes into his own. Because it has teeth instead of bristles, it is perfectly designed to be able to pick its way through longer hair, untangling knots as it goes. Those same knots and tangles will often get caught up in a longer beard. Not only does that stop a brush from untangling and tackling knots, it can be real painful too, as the brush snags and pulls on your beard. But that’s not a problem you will have with a beard comb. 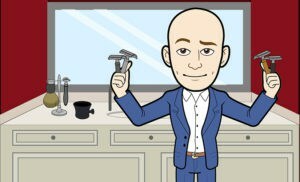 A final advantage of the comb is if you are interested in trimming your beard. Just think to your last trip to the barbershop. We bet that when the barber was trimming your hair, he probably used a comb too, right? It’s exactly the same story with your beard. 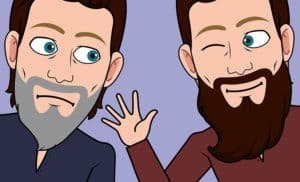 In fact, quite a lot of guys have beards that are actually longer in length than the hair on their heads. So it makes sense to deploy your comb when you’re grooming your beard. A good comb will allow for more control, especially when trimming your beard with scissors. You can pick out and isolate sections of the beard to trim, rather than wading in like Edward ScissorHands on meth and hacking at your whole beard like it a hedge growing off your face. 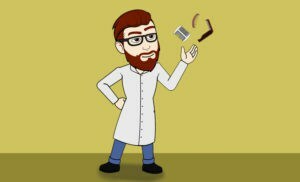 It’s a good reason why the best beard grooming kits almost always come with a quality comb inside – they are that important to the whole grooming process. 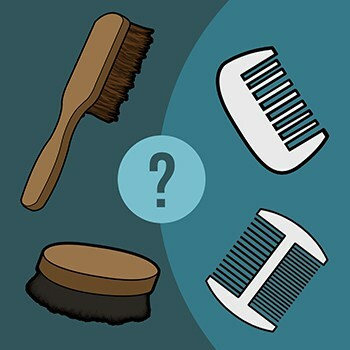 Which is Best for You – Beard Brush or Beard Comb? So that covers the benefits of both brushes and combs. But which one is the best for you and your beard? 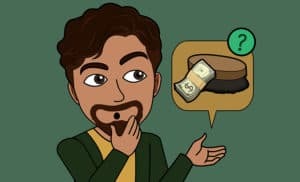 Well, you may well have picked up on the fact that a whole lot of the benefits that come with each tool are actually dependent on beard length. So for example the brush is better suited to a shorter beard. The fact the bristles are denser and tightly packed in the brush head makes it effective on shorter hairs, whilst it can get caught up in the tangled hair of a longer beard. Whereas a comb on the other hand has the opposite problem to a brush. 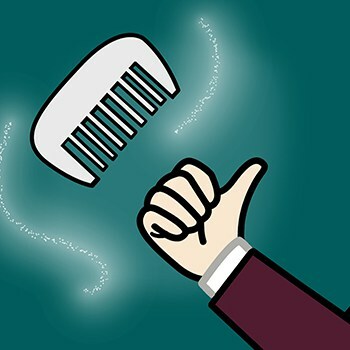 The teeth in the comb simply generate less friction than bristles. This in turn means they struggle to do much with short beard hairs. Combs are however great at working through longer hair, especially untangling and styling longer beards. How can you actually use this though? 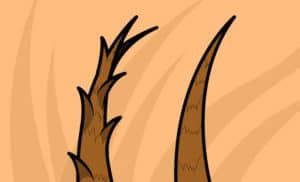 It’s all About the Length, Baby! We would suggest that for the first one to three months of beard growth that a brush alone will be sufficient. Of course, everyone’s beard is different so that is why we left a pretty big window there, as it all depends on how fast and thick it grows. Once you’re getting to the stage where the brush is not moving as freely through the growth, or when you are looking to style your beard a little more, that is the time to invest in a quality beard comb. Yeah we know, it’s not the best twist ending we’ve ever seen, more like the awful, awful end of The Village rather than “I see dead people,” in terms of twist ending pedigree. 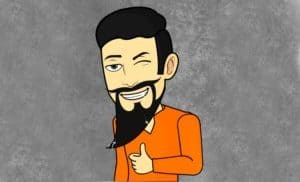 For the best beard maintenance program, we would suggest you probably need both sets of tools, especially if your beard is longer than, say, neatly trimmed to the jaw line. By investing in both tools, you’re going to end up getting the best of the positives that each tool brings. If you learn anything from this, it should be that it’s better when things work together, even things that seem, at first at least, to be competing. Pretty deep for a beard maintenance article but there you go, that’s what you come to Prim & Prep for. Whichever tool you go for (hopefully both!) we wish you happy growing, brushing and combing, fellow beardsmen!